One of the most intriguing applications of data mining is a Vanderbilt University Medical Center project that incorporates EHR technology and a DNA database. Mike Finley, MD, sees the future of the spirit, as well as the letter, of healthcare data accessibility, and it portends a clear shift in the way clinicians will have to regard the information in their care. As a new generation of tech-savvy patients enters the demographic of needing more healthcare services—and also demands more of a right in the use of their own health records—Finley says the industry must adapt. As more data are entered into the collective record digitally, the term data mining is becoming more prevalent as providers attempt to organize all that information from multiple sources to better diagnose and treat patients. But, as Finley says, the providers are no longer undisputed “owners” of the knowledge; a new generation of patients has access to an array of information from widely disparate sources. The larger question for clinicians may likely be to determine exactly which varieties of data mining are relevant clinically and then how to evaluate or build platforms to share with a variety of users across the entire continuum of care. For example, linking an EMR system with a deidentified DNA bank to deliver new information on factors such as gene mutations may predict effective treatments and outcomes for a given population of patients. But other applications could also be considered. For instance, a billing platform that scans payment decisions by competing insurance plans—and quickly tells a practice manager that coding mistakes resulted in patients being erroneously billed for balances by all those payers—may not be strictly considered clinical data mining or have anything to do with patient care per se. Nevertheless, a patient with a chronic and expensive condition may not agree. CHRISTUS Health is a development partner for a new clinical data-mining platform launched in September 2009 by Humedica. The platform includes a core “data factory” that collects information from disparate applications and creates a standard ontology. A retrospective comparative clinical analytic tool called Minedshare and a real-time predictive tool called MinedStream then retrieve and present the integrated data and help providers find high-cost and high-risk patients. All the applications are hosted by Humedica on a software-as-a-service model, priced based on discharge volume and/or number of full-time equivalent employees within an organization, and accessed via a browser. Finley is thus far satisfied with the Humedica platform; such tools, he says, may be increasingly important as the number of caregivers at any given patient’s bed increases. However, Finley also cautions that the deluge of data-driven healthcare will make deciding what applications and platforms to deploy an extremely difficult proposition. This choice will be made even harder as federal stimulus money for EHRs begins to flow through the system. 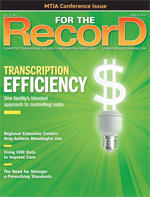 However bright the future of mining individual and demographic data to help clinicians deliver safer and more efficient care, the current reality is overall adoption of electronic records, especially in primary care settings, is low. Many EHR implementations are siloed from each other, even within the same institution, and payment incentives are still not aligned to make the best use of digital clinical intelligence. While Finley believes the federal stimulus money may move up widely functional data mining by 10 to 15 years, Breitenstein says the existence of the technologies alone may not denote installing systems that promise improved and more efficient coordinated delivery. “In the short term, stimulus money is a nice incentive for people to go out on a technology spending spree, but to have all those technologies work together to reduce costs will not happen until the healthcare payment system is aligned to really pay attention to outcomes and isn’t just a fee-for-service ATM for more tests and procedures,” Breitenstein says. As a result, the existing vanguard of large-scale clinical data mining may reside in integrated provider organizations that are already linking EHR capabilities with DNA data banks. Often supported by grants from the National Institutes of Health (NIH), these organizations cite pharmacogenetics as a likely first beneficiary of clinical data mining. For example, the NIH awarded researchers at Kaiser Permanente and the University of California, San Francisco $24.8 million in 2009 to conduct a genomewide analysis of DNA samples from 100,000 Kaiser Permanente members. This analysis will be linked to decades of historical clinical and other health-related information on these participants culled from health surveys and the Kaiser Permanente EHR. In announcing the award, Kaiser noted that the genetic information generated by the project will include new data regarding drug metabolism and drug response, information that may help researchers discover genetic factors that explain why people react differently to medications. Advanced pharmacogenomics are also likely to be a first payoff for the combination technologies of Vanderbilt University Medical Center’s BioVU DNA data bank, which now has 78,000 separate samples, and Vanderbilt’s EHR, which contains data on 1.9 million patients. Dan Masys, MD, chair of biomedical informatics at Vanderbilt, says clinicians can look for stories in the deidentified clinical data of people who did “very well or badly with particular medications” and then obtain corresponding DNA samples. Masys estimates the university spent $2 million constructing BioVU. Masys cites prostate cancer treatment as a potential beneficiary of such a technical combination. Masys says achieving this systems engineering approach has two prerequisites. One is being able to harvest from the data banks to look for patterns that are predictive; the other is having the necessary computerized decision support to send the harvested guidance back to clinicians. But How Patient Must Patients Be? Finley, Masys, and Breitenstein all predict that the new generation of tech-savvy patients, with a symbiotic mindset, will start demanding access to a variety of these decision-support tools as well. Masys says, in the short term, large organizations that offer their data-driven information to patients via patient portals will likely have a leg up on those that don’t, but the federal push to adopt EHRs will close that gap, especially as providers meet meaningful use thresholds for stimulus funding. Already, he says, NIH-funded research is showing promise in the eMERGE Network run by Vanderbilt and five research partners. Ultimately, the holy grail of clinical data mining may not involve putting everything on a single presentation layer for providers and patients but rather deploying technologies that are analogous to a football playbook and game film, with the doctor serving as the coach and the patient as the fully involved athlete. The patient’s own longitudinal data and population-based data on similar patients could be offered as predictive possibilities, while a real-time dashboard such as Humedica’s would serve as a safeguard that the game plan was being carried out. Such a product, she says, is not science fiction.